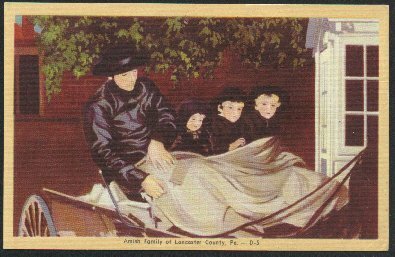 "Amish Family - Lancaster, PA - Circa 1918"
(787) POSTCARD: Amish Family - Lancaster, PA-Condition: Very Good.- Colored Illustration - Circa 1918. Amish Family sitting in Cart. Not Posted. Small amount of foxing on back. Price: $6.00 + shipping.